A recently published quantitative genetic study performed by Dr. Kenneth S. Kendler and his research team (REF. 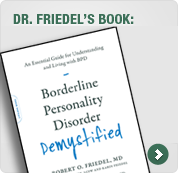 10) indicates that the heritability (the degree of genetic influence) on BPD behavior is 60%. This finding is in reasonably good agreement with former studies and underscores the importance of genetic risk factors in the etiology of borderline disorder.